The Hadley Cell, named after British meteorologist George Hadley who discovered this tropical atmospheric overturning circulation, is one of the basic concepts in weather and climate. Figure 1 shows the zonal mean overturning circulation in a latitude height plane for Boreal summer June-July-August (JJA), based on 30 years (1981-2010) of ECMWF data. It is seen that the JJA Hadley Cell is dominated by its ascent near 10°N and descent near 20°S, with motion towards the summer hemisphere near the surface and a return flow towards the winter hemisphere in the upper troposphere. This classic picture of the zonally averaged Hadley Cell gives a smooth impression of the cross-equatorial flow moving from one hemisphere to the other. The basic theories of the Hadley Cell are based on angular momentum conservation with the additional consideration of some mixing and friction near the surface. However, angular momentum conservation from zero velocity at the equator moving to another latitude, φ, gives a zonal wind u=aΩsin2 φ/cos φ (134 m s-1 at 30o latitude and 700 m s-1 at 60o latitude) that is many times larger than that observed as seen in Figure 1. It is clear from Figure 1 that the angular momentum is far from uniform and the motion crosses angular momentum contours. Consistent with this, the actual subtropical jet maximum of about 40 m s-1 at 30oS is very much smaller than the value suggested by the theory based on angular momentum conservation in the upper branch of the Hadley Cell. This implies that eddy angular momentum mixing processes are actually of order one importance. In this study, we will reveal some interesting features associated with the Hadley Cell. Figure 1: The JJA zonal mean overturning circulation in a latitude-height cross section, based on 30 years of ERA-Interim data. Colours indicate absolute angular momentum and blue contours indicate zonal winds. Firstly, to investigate the nature of the JJA momentum flux, Figure 2 shows the steady and transient momentum flux in JJA 2009. It is seen that in addition to the expected strong transient momentum flux in the midlatitude, whose importance for the Hadley Cell has often been stressed, both steady and transient fluxes show a maximum in the tropical upper troposphere, extending from the region of tropical convection in the summer hemisphere into the sub-tropics of the winter hemisphere. The dividing line between tropical positive values and sub-tropical negative values looks almost identical in the steady and the transient, suggestive that there is a motion with SW-NE tilts north of about 15oS and NW-SE south of that with an amplitude that fluctuates in time. The latitude-longitude pictures at 150 hPa show that this signature comes predominantly from the Indian Ocean (not shown). This can be seen in the case studies below (Figure 5). The Boreal winter picture indicates a similar tropical upper-tropospheric flux maximum but with the sign reversed as expected (not shown). This indicates that angular momentum flux in the tropical upper troposphere, which has been neglected, is very important for the existence of the Hadley Cell. 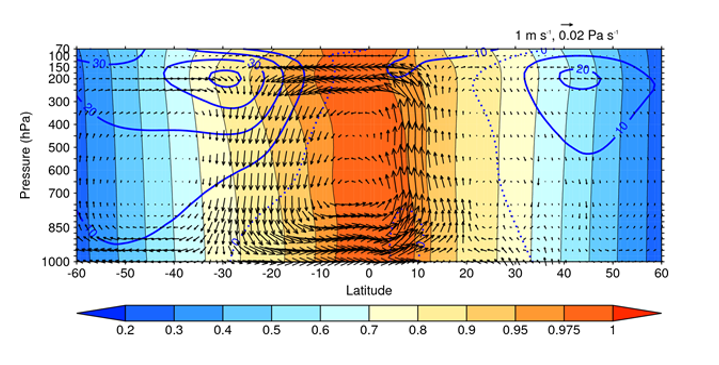 Figure 2: Northward momentum flux of westerly wind in JJA 2009. 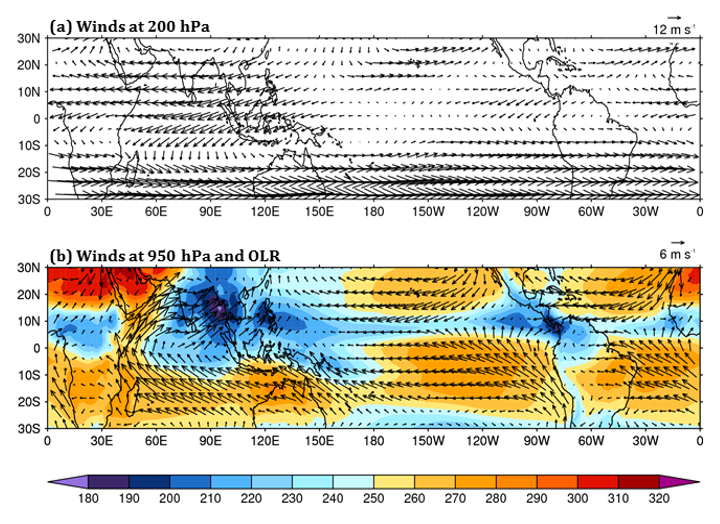 Then to examine the zonal and temporal variation of winds and convection in the Hadley Cell region, Figure 3 shows the JJA mean motion at (a) 200 hPa and (b) 950 hPa and Outgoing Longwave Radiation (OLR). It is clear that the zonal average motion described by the Hadley Cell occurs in longitudinally confined regions that can be associated with the tropical convective heating regions (Low OLR). The lower tropospheric meridional motion contains the flow from the S Indian Ocean into the S Asian and the W Pacific regions of convection. It also shows the flow from the S Hemisphere into the E Pacific and Atlantic Inter Tropical Convergence Zone (ITCZ) heating regions. In the upper troposphere there is a return flow in each of these regions. Figure 3: Climatology JJA motion. To illustrate the transient behaviour, Hovmöller of 5°N-10°S v at 200hPa (used to show the upper-tropospheric cross-equatorial motion) and 0-20°N OLR for 2009 JJA season are presented in Figure 4. The motion is seen to be localised in longitude and time. 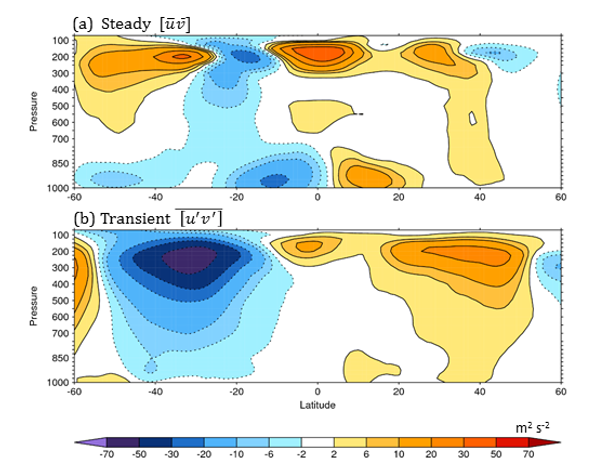 The cross equatorial motion in the upper troposphere is strongest in transient waves associated with convective events over the Indian and W Pacific region. Figure 4: Transient motion in JJA 2009. Finally, individual synoptic events in different longitudinal sectors are analysed. 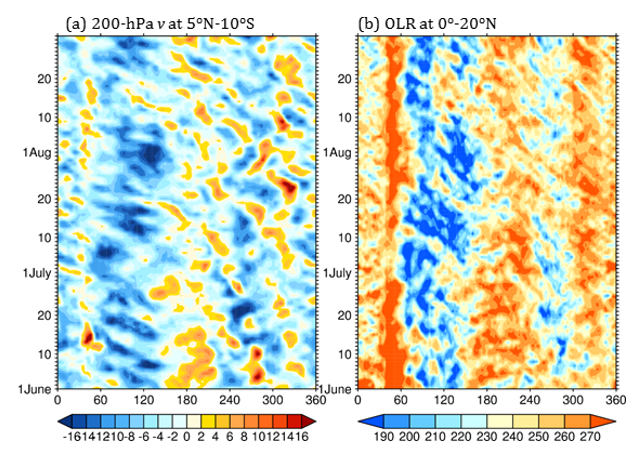 As a case study, Figure 5 (a),( b) show the upper and lower tropospheric horizontal winds for early July 2009 with contours of Potential Vorticity (PV) and OLR, respectively. On 6 July when convection is predominately in Indian sector, the lower tropospheric inflow is seen to have its origin from 30-40oS near 60oE. Two days later (8 July), in the upper troposphere, return flow reaches 30oS where it interacts with the S Hemisphere winter subtropical jet and the eastward moving synoptic waves on it, with a horizontal tilt consistent with that suggested by the momentum flux shown in Figure 2. A filament of N Hemisphere positive PV moves towards the anti-cyclonic side of the S Hemisphere jet. On 11 July, when convection is predominately in the Philippine sector, similar features are seen in a region shifted to the east. 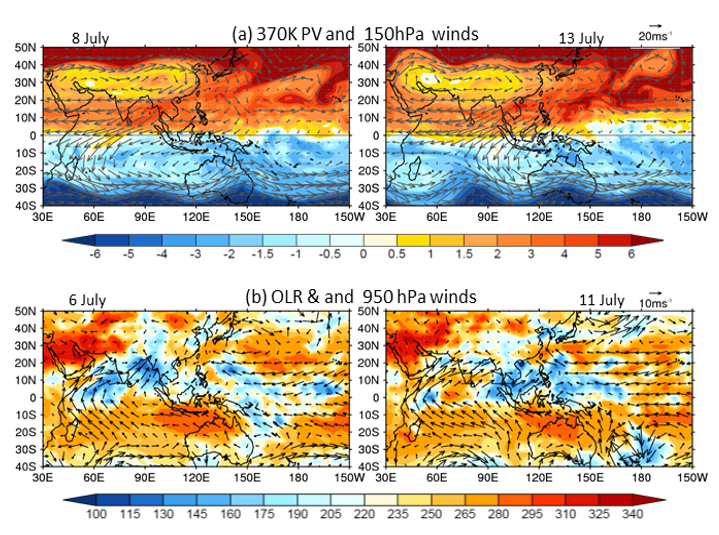 Figure 5: (a) 370K PV and 150-hPa winds and (b) OLR and 950-hPa winds in early July 2009, 5 days apart with OLR and lower level winds leading the upper level features by two days. (1) The existence of the Hadley cell involves not only the expected strong transient momentum flux in the midlatitude, but also the strong momentum flux in the tropical upper troposphere. (2) The upper branch of the Hadley Cell is concentrated in certain longitudinal sectors and intensified cross-equatorial flow is associated with flaring in organised convection in those regions. The tropical upper tropospheric motions associated with convection are crucial to the existence of the Hadley Cell. (3) Filaments of the upper tropospheric air move from the summer to the winter hemispheres or are mixed in; they can reach the anti-cyclonic side of the winter subtropical jet and interact with the weather systems on it. These observed features/processes have important implications on weather, climate and climate change, therefore it is important to know how well they are represented in weather and climate models. Also knowing that the cross-equatorial transfer of trace chemicals in the atmosphere occurs in filaments may have significant implications for atmospheric chemistry models, with almost undiluted summer hemisphere air moving deep into the winter hemisphere. This entry was posted in Climate, Climate change, Climate modelling, earth observation, Equatorial waves, extratropical cyclones, Tropical convection, Troposphere, Waves, Weather, Wind. Bookmark the permalink.